How about this for a picture....? And, how does it relate to locks...? Our MD, Sean Taylor, and his friend thought it was a really funny picture. Sean's wife wanted a picture of a windmill near where they were staying over the weekend. Clearly the photo hides the fact that this windmill is actually a full size windmill and the photo is a trick view.... probably not that hard to notice but by all accounts it made Sean and his friends laugh. So what has this to do with locks.....? Well, the simple fact is that people think that there lovely new (or old) UPVC doors are safe and secure because they have a 5 point lever locking mechanism. They are being "tricked" into thinking they are safe and secure. The standard of locks can be deceiving and a lots of locks can be "snapped" and give entry to your property within a matter of seconds. You see Sean was at a friends house celebrating a joint 50th birthday and moving into a new house that they had renovated. The house was lovely and situated high up a hill near Brighton looking out over the sea in the distance. They had installed bi-fold doors across the whole of the back of the house and had 3 other UPVC doors around the house. All the doors were brand new and cost a fair amount - they looked lovely and with the standard 5 point locking mechanism they felt safe and secure. Why wouldn't they.....? They had spent a lot of money on lovely doors and assumed that the locks would be of similar standard. Sean pointed out that it was clear the lock cylinders were of a very poor quality and should be upgraded as soon as possible. SO many UPVC doors contain the cheapest possible lock cylinders which is the WEAKNESS when it comes to the 5 point lever locking mechanism. How can you tell.........? The easiest way to check your lock is to look for a KITE mark. 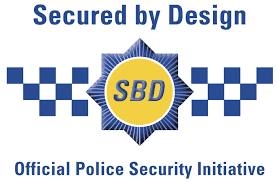 There are a few but you are looking for this as one of the main accreditations.... see below. If you have a UPVC door (or two) then we recommend that you get them checked by a reputable locksmith. These types of locks could even invalidate your insurance. You should check your policy. Door companies make doors, they don't do security!! To highlight this issue further Sean recently checked some other patio doors and was encouraged to see that the door had been fitted with a basic "anti snap" lock - an upgrade from the a basic lock. The picture shows the lock cylinder removed from the door and on the end with the key you can see a line which is a basic "anti snap" line. They had fitted it the wrong way around rendering the "anti snap" part redundant. So, when it comes to locks please take a closer look and make sure they are up to standard. The friends of Sean have now had new locks measured up and looking forward to feeling a bit safer.